As the kick-off date for the inaugural Indian Super League draws near, an additional 49 international players have been listed for the “central player draft pool”, scheduled to take place this Thursday in Mumbai. A total 56 internationals will compete in the upcoming league, the likes of which include Arsenal and French great Robert Pires and former Liverpool winger Luis Garcia. The drafting process will go through seven rounds of selection, with Delhi Dynamos, Northeast United FC and FC Pune City skipping the first two rounds due to prior international signings. 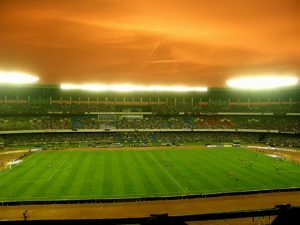 Each team competing in the Indian Super League will have 22 players, made up of seven internationals including one marquee, and 14 domestic players. The complete list of players available for the draft is below. Andre Matos Dias Pereira (Portugal), Jan Seda (Czech Republic), Marek Cech (Czech Republic), Apoula Edima Edel Bete (Cameroon), Gennaro Bracigliano (France). Andrés Felipe Gonzalez Ramirez (Colombia), Erwin Spitzner (Brazil), Henrique Dinis Oliveira Dias (Portugal), Cedric Hengbart (France), Jairo Andres Suarez Carvajal (Colombia), Jose Miguel Gonzalez Rey (Spain), Ilias Pollalis (Greece), Massamba Lo Sambou (Senegal), Raphael Romey (France), Sylvain Monsoreau (France), Tomas Josl (Czech Republic), Gregory Arnolin (France), Bernard Mendy (France), Pavel Cmovs (Czech Republic), Youness Bengelloun (France), Johann Letzelter (France). Park Kwang-Il (South Korea), Bojan Djordjic (Sweden), Jan Stohanzl (Czech Republic), Omar Andres Rodriguez Martinez (Colombia), Saidou Mady Panandetiguiri (Burkina Faso), Bruno Herrero Arias (Spain), Bruno Filipe Tavares Pinheiro (Portugal), Bruno Augusto Pelissari de Lima (Brazil), Cristian Hidalgo Gonzalez (Spain), Edgar Carvalho Figueira Marcelino (Portugal), Francisco Javier Fernandez Luque (Spain), Gustavo Marmentini dos Santos (Brazil), Victor Herrero Forcada (Spain), Guilherme Felipe de Castro (Brazil), Pavel Elias (Czech Republic), Jakub Podany (Czech Republic), Jofre Mateu Gonzalez (Spain), Do Dong-Hyun (South Korea). Luis Alfredo Yanes Padilla (Colombia), Miguel Bruno Pereira Herlein (Portugal), Miroslav Slepicka (Czech Republic), Michael Chopra (England), Arnal Llibert Conde Carbo (Spain), Diego Fernando Nadaya (Argentina), Eduardo Silva Lerma (Spain), Iain Hume (Canada), Ivan Bolado Palacios (Spain), Pedro Adriano Veloso Gusmao (Brazil).